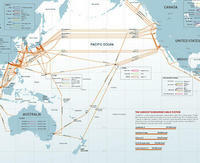 Google Planning Fast Trans-Pacific Cable? Google is planning a multi-terabit undersea communications cable across the Pacific Ocean for launch in 2009, Communications Day has learned. The Unity cable has been under development for several months, with a group of carriers and Google meeting for high-level talks on the plan in Sydney last week. However, Communications Day understands that Unity would see Google join with other carriers to build a new multi-terabit cable. Google would get access to a fibre pair at build cost handing it a tremendous cost advantage over rivals such as MSN and Yahoo, and also potentially enabling it to peer with Asia ISPs behind their international gateways – considerably improving the affordability of Internet services across Asia Pacific. Communications Day reported on 8 February that Google had begun peering with ISPs, enabling them to reduce their reliance on transit services via Tier 1 non-peering major IP networks such as Level 3 and AT&T. Another source said that Google’s move could be disruptive to the capacity industry as it takes a major source of traffic – and revenue – out of the general market place. I would bet that other source is from the traditional telecom industry, which as far as I’m concerned could use some disruption. Is that some whiff of competition coming from Google’s direction? No wonder the coyotes of telecom are howling! This entry was posted in Capacity, Competition, International acces, Internet freedom and tagged Google Unity Pacific undersea cable telecommunication Level 3 AT&T on September 24, 2007 by John S. Quarterman.